Aldo Tambellini (b.1930) was a pioneer of expanded media in the 1960s, and one of the first artists to use video and television as a medium. Specially conceived for the Tanks, Retracing Black draws upon his early work to create an immersive media environment. Tambellini began to explore more participatory Electromedia work in 1963, fusing slide and film projections with music, dance, video, spoken word, performance, poetry and politics. 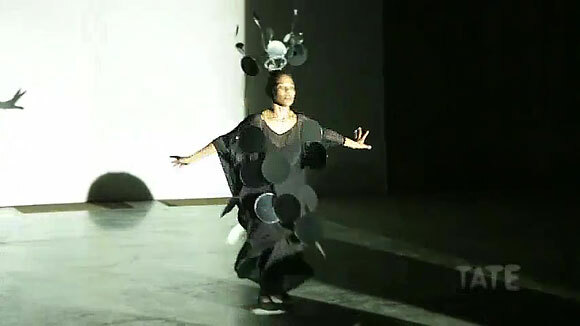 Retracing Black reflects on his transition from paint to film to video to experimental performance, highlighting his fascination with circular shapes and blackness. A triptych of hand-painted 16mm films from the Black Film Series is featured along with unreleased works filmed by the artist in 1960s New York, while a series of projected ‘lumagrams’  hand-painted glass slides  transforms cellular forms into a sculptural, kinetic installation. Electronic sound compositions are intertwined with the spoken words of Calvin C. Hernton, a poet and member of the Black Art Movement. Television footage of 1960s political events and fragments filmed in working-class areas of Brooklyn and Manhattan reveals the transformation of New York City and its shattered political and economic system. Tambellini focuses on the merging of the private dimension of everyday life and the public dimension of television. Tambellini’s video works subvert the power of the television image, turning to the structure of the cathode emission itself. The study of light and real-time transmission are the key points of the Black Video series, resulting in an ‘aerial painting’ of throbbing and pulsating blinding flashes, caught in constant movement. In 1967, Tambellini and Otto Piene established The Black Gate Theatre, a crucible for intermedia performances. Their collaborative work Black Gate Cologne was an Electromedia happening recorded in a Cologne television studio. Broadcast in January 1969, it was the first full-scale work of art for broadcast television. There will be a screening of Tambellini’s films in the Starr Auditorium on 13 October at 18.00 and a performance in The Tanks on 13 October at 21.00.
and three 35mm slide carousels, b/w, sound, 22 min.